In a large bowl, mix loud, sugar, baking powder and salt to combine. Add cold butter, rub with your fingers until the mixture resembles crumbles. Add in walnuts, cheeses, bacon, ham, garlic and green onion. Mix well. Make a well in the center. Whisk cream and eggs in a small bowl to combine. Reserve 2 tbsp of the egg mixture for glazing. Pour the remaining egg mixture into the flour mixture. Using a spatula, mix until the dough just combined. Transfer dough to a floured surface. Gently knead the dough a couple of times, then pat into a disc. Divide the dough in half, then shape each half into a disc of 6-inch diameter. Cut each disc into 6 equal small wedges. Place the scones on a floured non-stick baking pan and chill in the freezer for 30 minutes (see note below). Meanwhile, preheat oven to 375°F. 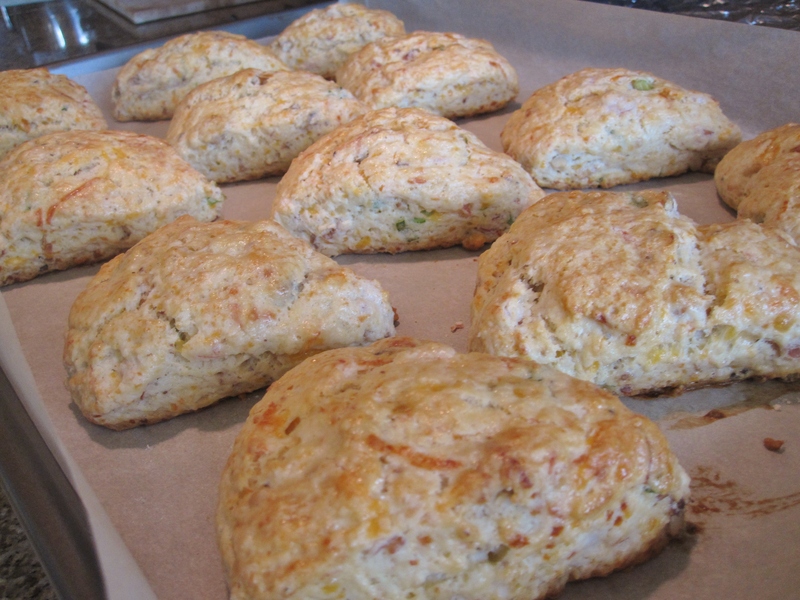 Glaze the egg mixture on chilled scones, and bake for 20 minutes. Cool scones slightly on a rack. Served warm with butter. 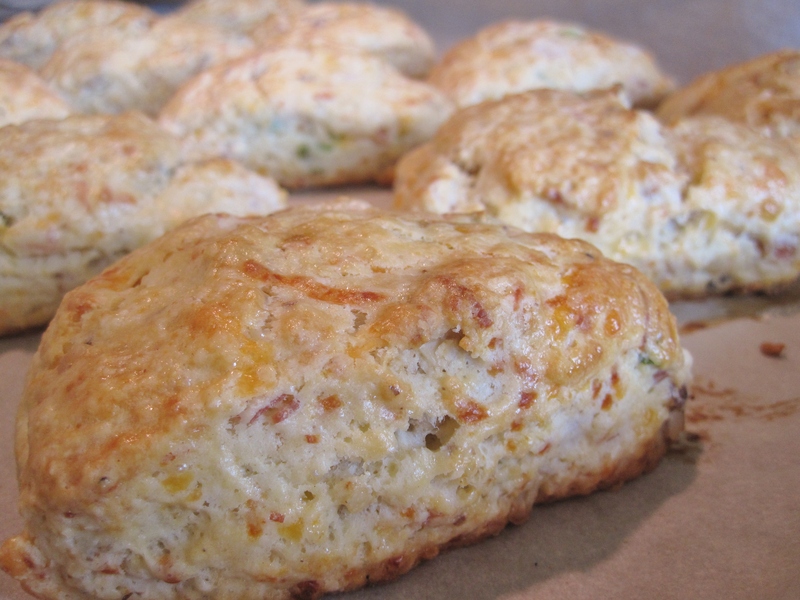 Freezing scones: According to King Arthur’s Flour website, chilling scones for 30 minutes before baking help relax the gluten in the flour, and thus producing flakier scones. My view is that if you have time and room in your freezer, go for it. If not, pop in the oven right away is okay too, just be sure to preheat the oven before prepping. If you want to spice it up, feel free to add in some crushed red chili flakes or fresh chopped jalapeno peppers.